Random House Books for Young Readers, 9780553520989, 32pp. The same team who brought you Where Do Diggers Sleep at Night? 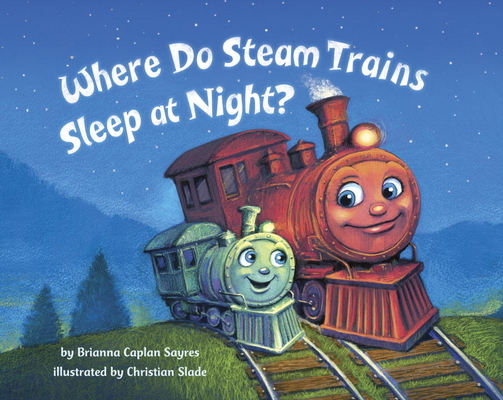 have engineered another rollicking bedtime story—for train lovers everywhere! Have you ever wondered what little trains do when it’s time for bed? The same things you do! Freight trains, passenger trains, subways, trolleys—and more—wash up, have a snack, load their teddies for story time, and get rocked to sleep by mommy and daddy trains beneath a blanket of stars. Little train lovers with a one-track mind will gain a new affinity for their bedtime routine when they find they share it with their favorite vehicles. BRIANNA CAPLAN SAYRES didn’t know a breakdown train from a roundhouse—until her three-year-old fell in love with Thomas the Tank Engine! Now Brianna and her husband are busy chugging along with their two boys in Seattle. She is also the author of Where Do Diggers Sleep at Night?, and Where Do Jet Planes Sleep at Night?, illustrated by Christian Slade. You can visit Brianna on the Web at briannacaplansayres.com. CHRISTIAN SLADE’s classic, distinctive art style can be found in picture books, novels, and magazines for children. He holds an MA in illustration from Syracuse University, as well as a BFA in drawing and animation from the University of Central Florida. He lives with his wife, two children, and two corgis in Florida. Visit him on the Web at christianslade.com.